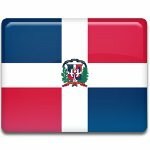 September 24 is celebrated as Our Lady of Mercy Day in the Dominican Republic. This public and religious holiday celebrates the country's patroness, Our Lady of Mercy (Nuestra Señora de las Mercedes). According to legend, before leaving the island of Hispanola, Christopher Columbus erected a cross atop a hill in the Cibao region. In 1495, a battle between the Spanish conquerors and the indigenous population occurred near that hill. During the battle, the Virgin of Mercy appeared and frighted the Indians, helping the Spanish win. Reportedly, Our Lady of Mercy appeared on the site several times. Eventually settlers decided to mark the spot by building a church dedicated to the Virgin of Mercy. The feast day of Our Lady of Mercy, which is celebrated in the Roman Catholic calendar on September 24, was declared a public holiday in the Dominican Republic because the saint is venerated as patroness of the country and the entire island of Hispanola. Our Lady of Mercy Day is a national holiday. It is marked with special masses in churches and colorful processions. The main celebrations are held in the capital city of Santo Domingo and in Santo Serro, where a church has been erected in honor of the saint. This site is visited by thousands of pilgrims every year.